Prepaid-card provider Green Dot Corp. is in talks to buy UniRush, a smaller competitor co-founded by Russell Simmons, the music industry entrepreneur behind rap label Def Jam, according to people familiar with the matter. UniRush, which is backed by private equity firm The Carlyle Group, is worth about $150 million, one of the people said. AltAssets reported Carlyle is shopping UniRush and its RushCard. Carlyle might be able to squeeze maximum value given all the talk of cashless societies at the recent World Economic Forum in Davos, Switzerland. 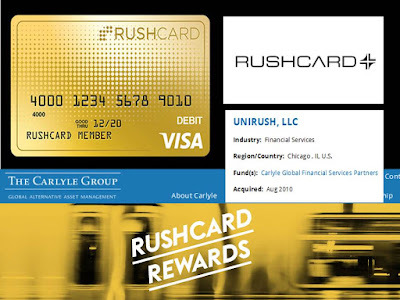 Carlyle invested in UniRush in 2010. A year later Florida's Attorney General investigated the company for hidden fees. Private equity firms have long been accused of hidden fees. It should be no surprise that an affiliate might have been doing likewise. "agreeing to settle a lawsuit from holders of its RushCard who temporarily lost access to their money due to a system glitch." Recall Carlyle's reputation as a savvy tech operator. 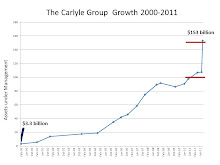 The Carlyle Group is exiting investments at a rapid pace (yet again). What will their RushCard reward be? Update: Naked Capitalism and Washington's Blog ran stories on the the global cashless society push. Update 2-2-17: UniRush will pay $10 million in restitution on top of the $19 million settlement in a class action suit. I wonder how much of this will hit Carlyle Group limited partners. Note the MarketWatch story made no mention of Carlyle's ownership stake in UniRush. Reporters need to keep access to the general partners.